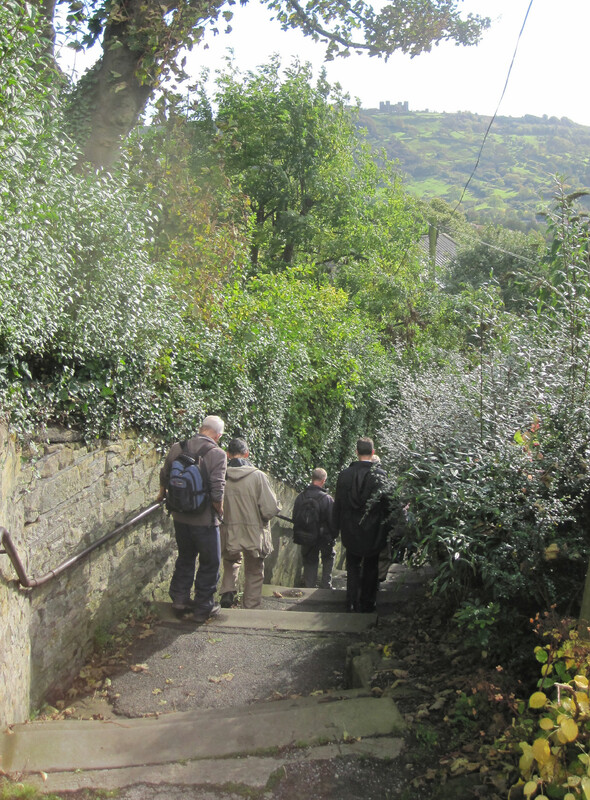 With the scheduled leader away in Australia, many thanks to Jean, who led 18 of us from Hartington Station to Alport, via the Tissington Trail and Bradford Dale this Wednesday. 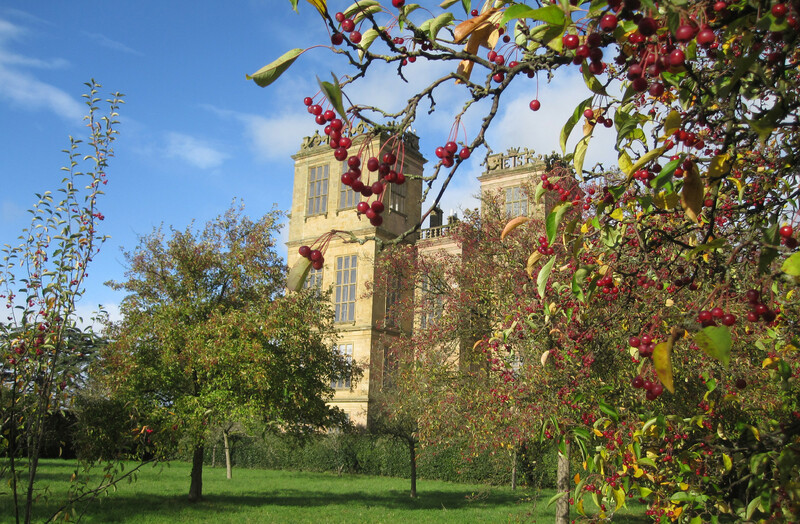 After all the recent rain it was a good autumnal day, as was a visit to the always photogenic Hardwick the previous day. This is part of what we did last Thursday – starting to put the section of Staveley FP58 near Ringwood Park back on its definitive line. More work to do but its a start. Nearby we relocated two waymark posts. 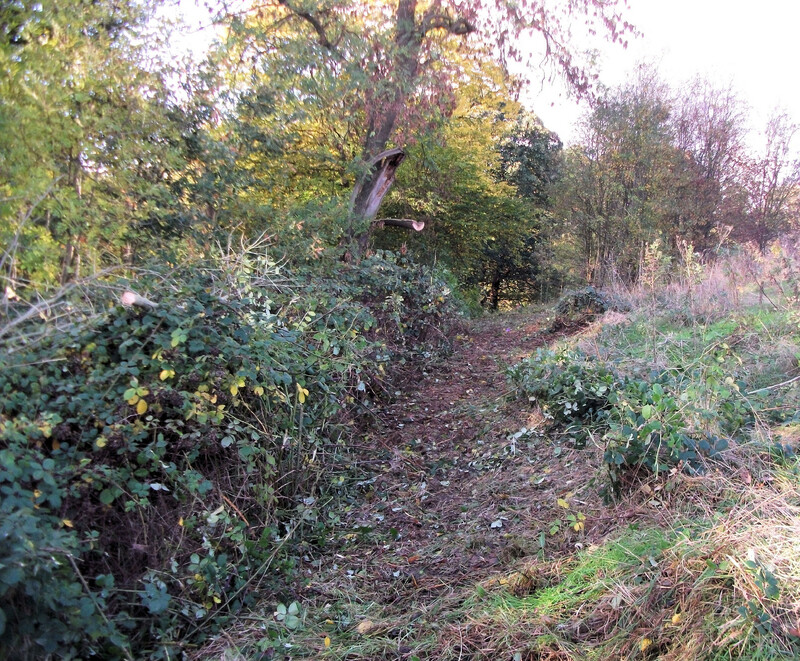 The work will be followed up next spring to get the legal line walked which it hasn’t been for a long time…. Earlier we replaced three steps on Brimington FP1, removed a tree which was hiding the sign posts, and carried out a general cut back…. On Tuesday we replaced an awkward stile, reported in July 2012, with a wicket gate on Brampton FP34 near Westbrook Drive. 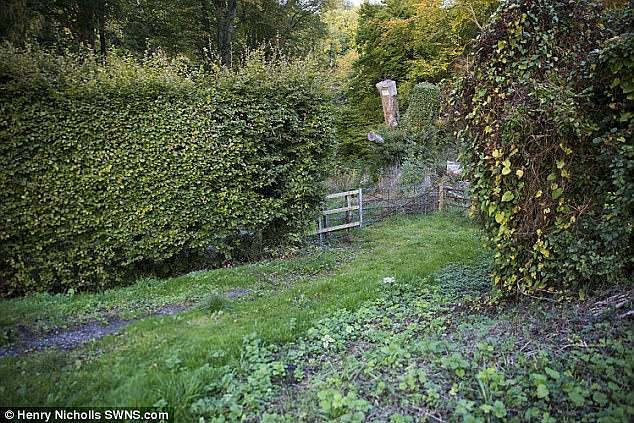 Complete with a side ‘fence’. A muddy morning for us…. The team are always glad of additional help. Volunteers warmly welcomed. What are these people doing standing in the rain ? Listening to Godfrey’s excellent commentary on the alley-ways of Matlock, of course. With ground conditions very wet in the countryside after days of incessant rain, twelve of us were treated to a guided tour around a town that provides first class urban walking. 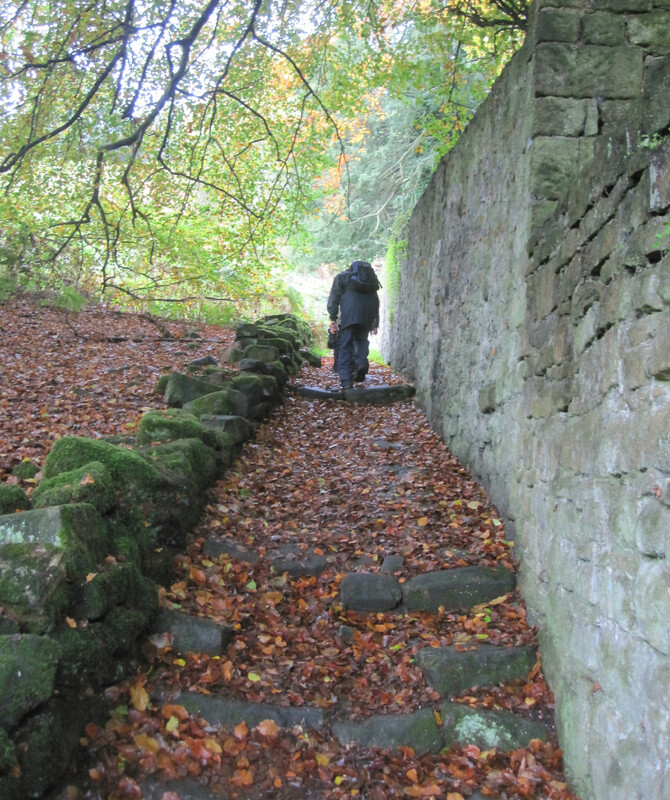 We felt a little like the troops with the Grand Old Duke of York, but the exertion was well worthwhile – and it was great to be out walking again on a day with only light showers. Why do we always have to go into the countryside to enjoy walking ? As already announced, the next Chesterfield Area Walking Festival is to take place from 10-18 May next year. We’re glad to be associated with this and plan to once again play a significant role in leading walks and checking that rights of way are passable on them. 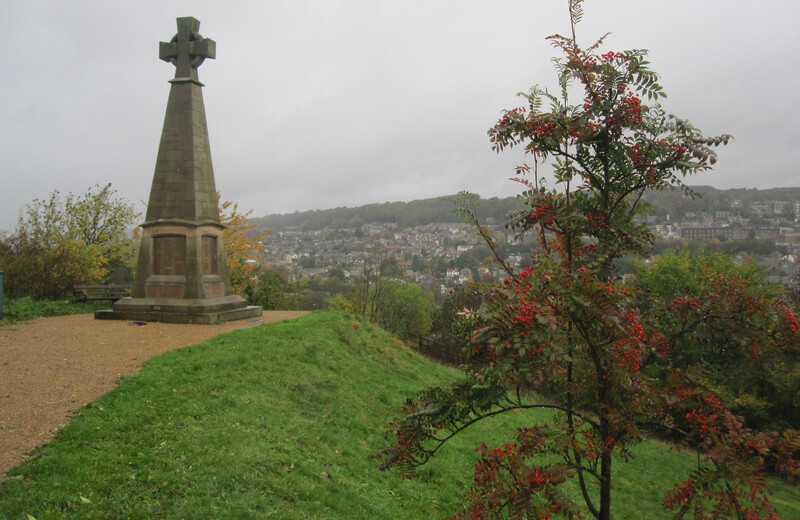 We’ve great countryside in the Chesterfield area, as well as being close to the Peak, but can’t walking in a town be made a bit more enjoyable ? The problem is fairly obvious. In common with many towns we have not made much serious provision for pleasant, safe pedestrian or cycle routes in urban areas to replace the paths we had before they were covered by modern development. There has not been a lack of vision. 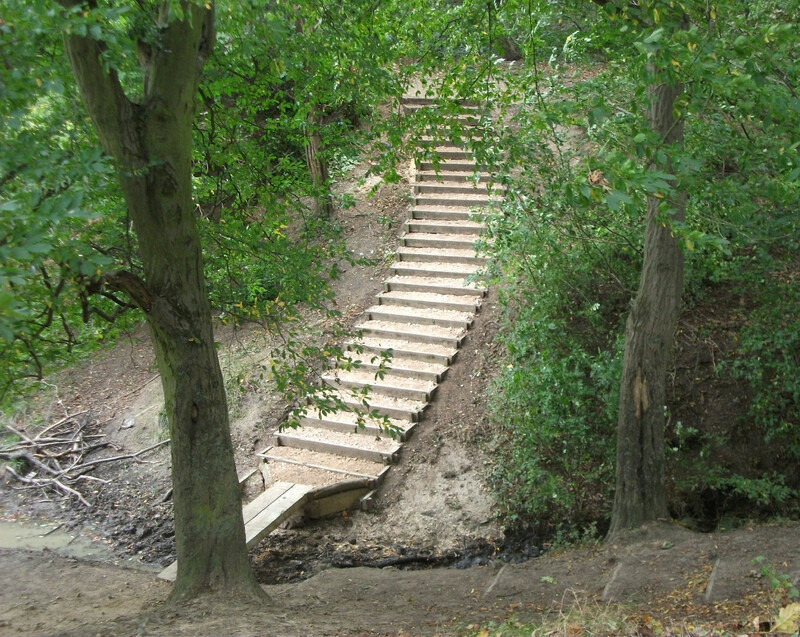 One version of the Chesterfield Masterplan of October, 2009 refers to ‘greening’ our river corridors. Unfortunately this is often firmly associated with commercial developments such as the ‘Waterside’ project, which in a time of economic stringency may take some time to be accomplished. Surely the time has come to break the links and consider the cheaper option of simply developing footpaths (and cycle tracks) from outlying areas to the town centre ? 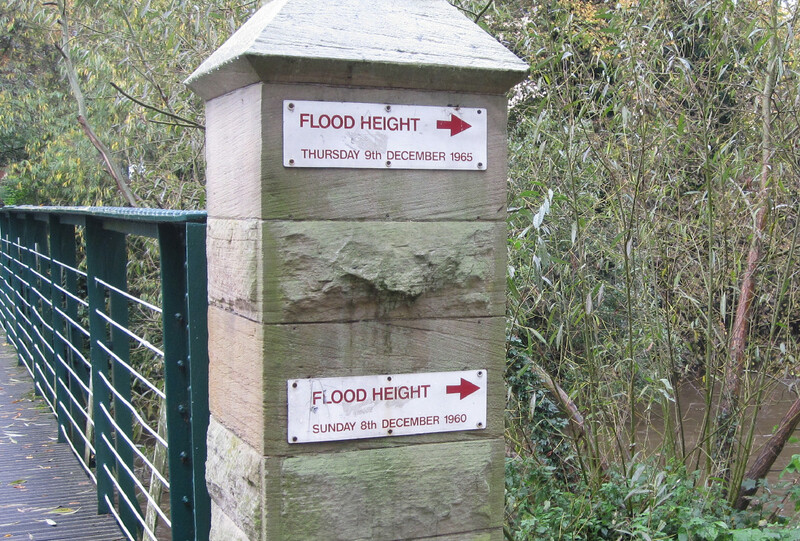 River courses for example are often ready made for such routes and (where flooding is a constant risk) are unsuitable for anything other than pathways. 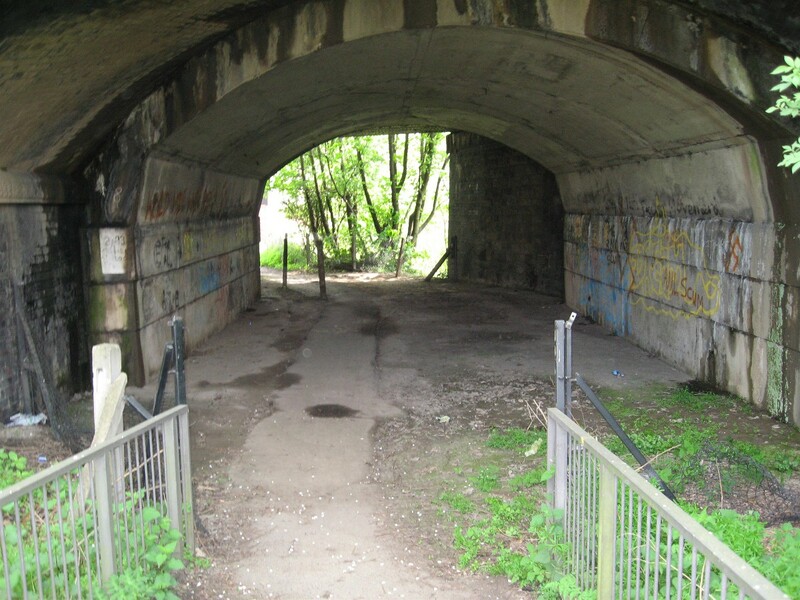 For a fraction of the cost it takes to build new roads or high speed railways we could develop pathways by river courses and designate them ‘rights of way’ – rather than seeing ever more traffic unleashed on to areas like Derby Road. There are four excellent reasons for doing this, and by-passing congested car routes wherever possible. The cost of energy rises much faster than inflation or wages each year. This is unlikely to change. We have to face the fact that eventually we must cut back on car usage for our relatively short journeys. It’s not rocket science. Even if by some miracle cheap renewable energy sources quickly arrived there is a limit to how many vehicles we can accommodate in town and city centres. Few people deny that motorised transport contributes to pollution and global warming. Let’s enjoy each walking festival – but for those who want to leave their home and walk / cycle directly to either town or country, we need to make it a possibility and convert a vision into reality. 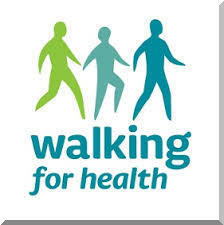 Talk to your local councillor and let’s start to get walking on the agenda. 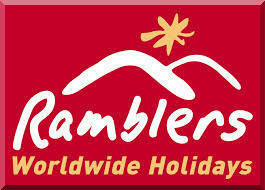 The Ramblers are a registered charity …. perhaps not a lot of people know that. Although we’re primarily walkers some of us, for example, do our bit for the community by helping Derbyshire County Council maintain the rights of way infrastructure – and by combining with organisations like Sight Support Derbyshire in countryside walks for the visually impaired. We’re critically short of guiders for our monthly walks with Sight Support and always welcome volunteers on our weekly path maintenance work. If you can help with either please let us know. No one knows our local canals better than David, and he’s provided two photos from last week’s wanderings. We all know about defence cuts – but if this is South Yorkshire’s privatised independent deterrent who is it pointing at ? 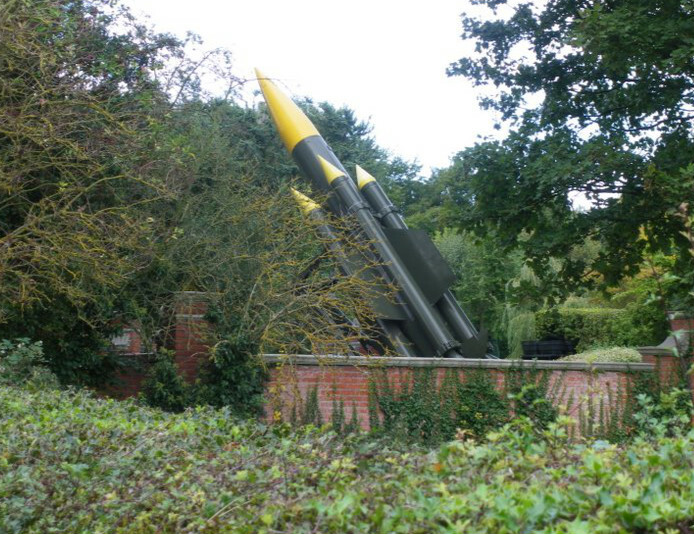 Training for the high jump in Nottinghamshire ? A pole vault over the wall could be in order. A bad start to today’s long bus walk when the Eckington bus broke down in Old Whittington. 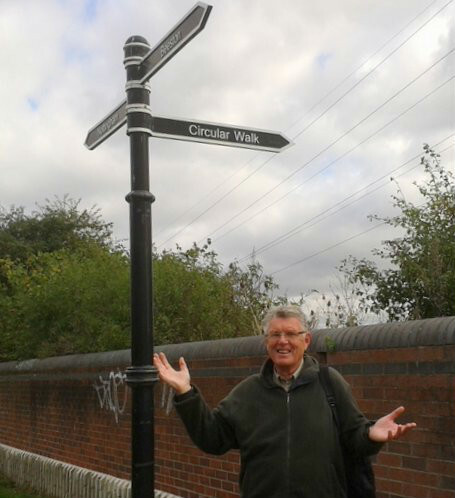 Nevertheless when we did get going, Basil led 18 walkers on a circular that included the Trans Pennine Trail and the Cuckoo Way by the Chesterfield Canal. 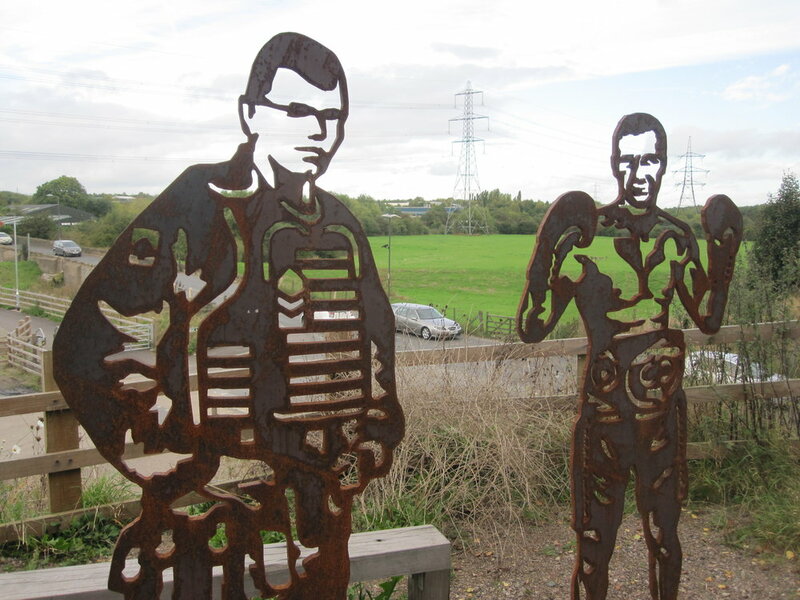 The three Killamarsh statues by the Trans Pennine Trail are sadly beginning to rust. On current plans this area and its rights of way will have to cope with the passage of high-speed rail (HS2). Will it get any benefits ? 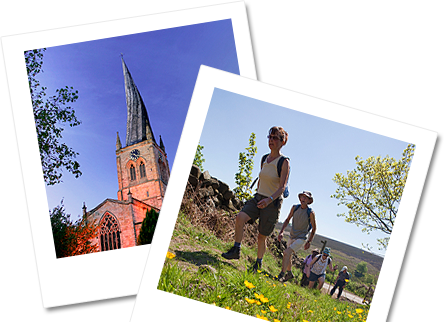 As well as our own extensive walks programme we always play a significant role in the Chesterfield Area Walking Festival each May. This has to be planned well in advance and if there is anyone keen to lead a walk in the 2014 Festival please let us know as soon as possible. It’s from the 10th to the 18th of May. Walks have to be substantially in the north-east of the county.